All trolleybuses in St Petersburg work nearly the same way as the trams and buses. They are cheap, efficient and most of them cover many areas of the imperial city that the metro doesn't. Typical trolleybuses running in the city of St Petersburg, Russia. The system network of the trolleybus in St Petersburg has grown since WWII, but in the last few years, the numbers of these environmentally friendly buses have been reduced. In fact, in 1990 the city had 1300 trolleybuses that carried 550 million passengers a year. Today we have 44 routes and only 700 trolleys running in the city. Despite this huge drop, the electric bus is a means of transport much used by Petersburg residents or expats living here, but not so popular with visitors. Simply because the language is a barrier. Basically, getting off from one of these trolleys can be confusing if you don't speak Russian or you don't know where to go. For your information, these Russian trolleybuses are also overcrowded on the main routes and are old fashioned, although a few have been recently renovated (but only in the city center). So this can be also another reason to avoid taking them! Still thinking of taking a trolleybus in St Petersburg? If so, learn how to get around with the trolleybus below. To get started just click on a topic below to fast-track to that section. So, if you are confident enough and you just need to make a short trip, then the trolleybus is another travel option that you can choose to get around the city of Peter the Great. You will find trolleybuses in large avenues of the city and mainly across the outskirts. However, you should take only those electric buses running along the famous main road Nevsky Prospekt (№1, №5, №10 - each of these trolleys will bring you to the Hermitage, the Kazan Cathedral, and the Hermitage). When looking for trolleybuses in St Petersburg search for the stops marked with signs with a blue letter "T". If you are wondering about routes, then you should check at the stops. They are listed there but in Russian only. Wondering how to buy your ticket? No worry, it is very simple. You can buy your ticket on board from the conductor (usually wearing a yellow jacket or top, as well as special uniforms) and pay in cash with small notes or much better with coins. Remember, conductors check whether everybody has paid and sell tickets to those who need them. So, don't be surprised to see an occasional inspector, who might ask you to show your ticket. 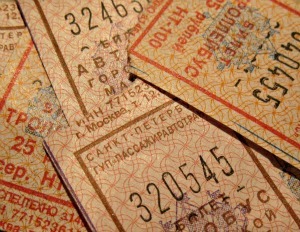 All tickets on the trolleybuses cost the same as the bus and the tram – 40 Rubles (€0.60/US$0.70), one way. Bear in mind that if you are caught without a valid ticket you will be fined 2000 Rubles (30€/US$33.00). This applies also for all other public transportation in the city. The first trolleybus in the city of St Petersburg was brought to light by engineer P.A. Freze on March 31, 1902, but regular trolleybus services did not begin until October 21, 1936. The majority of trolleybuses were built locally, though after a while the city started buying better vehicles built in the city of Yaroslavl (on the Volga River). By 1941 Leningrad had 130 trolleybuses servicing the city along several lines. All trolleybuses stopped running during the Siege of Leningrad and services were resumed only in May 1944. In case you would like to learn more about trolleybuses in St Petersburg, you may like to stop over at the Museum of Electrical Transport and see the first trolleybus of the city, a rare piece of history. There, you will also find a valuable collection of old St Petersburg trams. We believe that you will easily get to any site and attraction by travelling with the metro, than by any other Russian public transport, but this is up to you. 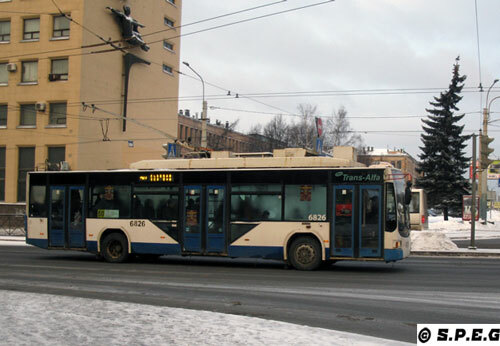 From Trolleybuses in St Petersburg return to Travel in St Petersburg or go to the Homepage.